The so-called health care reform bill now before the Senate, with the addition of Majority Leader Harry Reid's Manager's Amendment, amounts to a health insurance bill for half the population and a sweeping anti-abortion law for the rest of us. And by the way, it's the rest of us who voted the current leadership into both houses of Congress. We call on all senators who consider themselves friends of women's rights to reject the Manager's Amendment, and if it remains, to defeat this cruelly over-compromised legislation. Support for abortion rights is a litmus test issue for me. I’ve never voted for an anti-choice candidate, no matter how good that candidate might be on economic justice issues. And I don’t expect to ever vote for an anti-choice candidate. I will write to my senators to let them know how outraged I am by the anti-choice language in the bill. I will continue to lobby to get this language out of the final bill, but I don’t want to ask my representatives to torpedo the final bill. I have gone back and forth on this. What finally clinched it for me, was Gail Collins’ article which jogged my memory about what happened when progressives failed to work together to mobilize support for child care. Back in 1971, Congress passed a bill aimed at providing high-quality early childhood education and after-school programs for any American family that wanted them…Then Richard Nixon surprised almost everyone by vetoing it. The social right, which was just beginning to come into its own, was delighted…. In the end, the people who hated the whole idea were much more energized than the people who loved the idea, but disagreed on the details. At that stage in my life, I thought the 1971 child care bill was too flawed to support—-nothing short of free childcare for all would have satisfied me. I didn’t realize at the time that we had just blown a historic opportunity which would have made an enormous difference in women’s lives. If there had been enough support from progressives to override Nixon’s veto, the bill would have in all likelihood have become stronger over time. By now, Americans would view government subsidized high quality child care as a right—-just the way Europeans view child care as a right. We forget that social security was not widely supported initially, but there is now a consensus that financial support in old age is a right of citizens. Something similar is likely to happen with health care. At this stage in my life, I am willing to take half a loaf to establish the principle that all Americans have a right to health care. We can’t miss this opportunity. 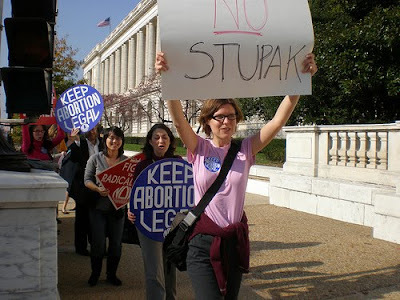 The Stupak amendment is indeed abominable. But O'Neill's take on this is off. My understanding is that the compromise Reid worked out with Nelson is that each state will have the ability to decide whether or not to allow abortion funding in its exchanges, but that the national nonprofit plans will all cover abortions. So no woman in any state will be denied the opportunity to choose a pro-choice plan. It's actually a clever bit of give-and-take for Reid (who's pro-life himself); general abortion rights are preserved, but the states get to have "clean hands." In fact, the Manager's Amendment that O'Neill shreds is so much more pro-choice than the Stupak Amendment that some conservative pro-life Dems in the House are threatening to bolt the bill because of that compromise. Do they have a better understanding of the implications of the proposed amendments relative to the House bill than the President of NOW? That would be sad. It's also unhelpful and misleading to describe the bill as "a sweeping anti-abortion bill" for half the population. IF you live in a state that bans abortion coverage from their exchanges AND you actually qualify for the exchanges (not very many people do), then you will probably have to go with the nonprofit plan if you want abortion coverage. Nobody is being denied the right to an abortion, nor are people who currently have health care plans going to have abortion coverage stripped from their plans. It's not an ideal provision at all, but to secure the 60th vote from a very pro-Life Senator AND to set the framework for what will be a tough debate on this in conference, this was a very smart compromise, one that affects the minimum number of people and that affects no one absolutely. This is the biggest tragedy of this bill -- very few people are affected, especially anytime soon, and yet we are acting as if we will all immediately be in the jackpot. It's a recipe for low information and high anxiety. Thanks to Tim for the additional analysis. I hadn't read the fine print, but I was already where Karen wound up, even before I read Gail Collins' excellent (as always) piece. All of the sweeping social/economic justice programs we now value started out narrow and small and have expanded in benefits and eligibility since then (okay, except for welfare which expanded and then contracted). We must start somewhere, grab what we can now, and build on it over the years. Dr. Atul Gawande, whose common sense and well researched positions I have come to rely on to steer my thinking on this debate, has another excellent piece in a recent New Yorker. Using the saving of the American agricultural industry in the early 20th century as a comparative lesson, he illustrates the value of the many pilot programs that are included in the bills which he expewcts will lead to large cost savings over time. There are also many provisions which do kick in immediately, including curbs on insurance company's power to deny coverage for pre-existing conditions,or end coverage when people get sick. There are other instant benefits, which I don't have time to chronicle now. And anyway, we do need to see what comes out of conference before we crow too loudly yea or nay about any of this. But bottom line, we will get some kind of bill, and the President will sign it, which will instantly improve his reputation and that of his administration, and which will form the basis for future reforms. It's more than nine other Presidents have been able to achieve, and especially given the appalling nature of the Republican Party these days, it will be truly historic. Tim, as I keep saying, I really wish you would go back to political blogging (although I realize it might get in the way of an academic career).